Since sitting down to write this week’s posting I’ve been slammed with “urgent” emails relating to everything from a mysterious leak that’s appeared in my downstairs neighbors’ closet; a busted basin in my bathroom that’s rendered the sink unusable; a variety of issues relating to my upcoming office move (insurance certificates, the correct meter number for Con Ed, Internet provider options, etc. ); outstanding payment for a story I filed way back in early September; and a number of other subjects too tedious to mention. In other words, I’m dealing with the sorts of things we all contend with on a daily basis . . . but that today are proving particularly difficult for me to shut out — something I must do, though, if I’m to get to that quiet place necessary from which to write a coherent sentence. It reminds me of this ad I used to see as a kid on TV in which a harried working mom, stressed out over her job, her baby, even the family dog (! ), throws up her hands and exclaims in a desperate voice, “Calgon take me away!” (followed by a quick cut of said harried mom luxuriating in a bubble-bath). Well, I haven’t been magically teleported to my bathtub, but just listing a few of this morning’s distractions does seem to have served a similar function — my mind is quieter, at least for the moment. Which means I can turn my focus to more important things . . . namely food, and specifically the subject of this week’s posting. It’s one I’d categorize as a happy accident. Not because I came up with it myself while playing around in the kitchen (it comes from the November issue of Saveur and not my head), but because I decided to make it thinking it would be one thing and early in the process discovered it to be something else entirely — something even better than anticipated. You see, the thing I thought I was making, and that originally brought me to the kitchen with all the various ingredients, was based on the recipe’s captivating title: “Onion and Bacon Tart.” Through no fault of the magazine, these four words led me to believe that the end result would produce something flat and crusty — like a bacon and onion pizza, but without the cheese and tomato sauce. I like the cheese and tomato sauce in a pizza, but I’m also a big fan of caramelized onions and bacon, and the idea of giving these two complementary items a star turn atop a homemade crust sounded pretty appealing. I also thought it had the makings for a perfect weekend lunch, or an enticing pre-dinner snack (sliced into bite-sized pieces). I don’t know about you, but it doesn’t take much more than that to get me into the kitchen. . . The thing I’d failed to register, though, was the fact that the recipe offers the revealing statement that the dish’s custard-like batter is “a cousin of Yorkshire pudding,” and that it “puffs like an enormous popover in the oven.” I’m not quite sure how I missed this statement since it’s the first sentence of the actual recipe, and because the words Yorkshire pudding are ones that typically grab my attention, but miss it I did. And in truth, such is my excitement when I come across a new recipe that it’s not so unusual for me to overlook a few key details until I actually get down to cooking. Which is to say that as I began assembling my various ingredients I discovered that what I was undertaking was not so much the perfect weekend lunch but rather the ideal accompaniment to the prime rib I’ll be making for Christmas dinner. Now I’m a big believer in staying true to certain food traditions — I like a turkey on Thanksgiving and a roast beef on Christmas. But if there’s a way to gently tweak those traditions in an interesting way, I’m all for it. And here was just such a way. Rather than the Yorkshire pudding standard, which in my experience is at most enlivened by some dried thyme or rosemary, here was one that went whole hog . . . with a scattering of slivered bacon and caramelized onions. What’s more, the recipe offered an alternative to the standard cooking approach, which calls for using the meat drippings from your finished roast as a base for the pudding — a rewarding but time consuming step when you’re trying to juggle multiple dishes and coordinate getting everything on the table before anything goes cold. Instead, the Saveur recipe calls for taking the fat rendered from the cooked bacon and using that as the base for the pudding. It’s a strategy that’s as decadent as it is simple, allowing you to cook the pudding independently of the roast, thereby excising at least one bit of stress from your holiday season. Of course, you can always make a Yorkshire pudding with melted butter instead of meat drippings, and even without the various enhancements listed above it will be pretty wonderful (particularly in the company of a few slices of roast beef and a dollop of horse radish-enhanced crème fraiche). But trust me when I say that the addition of the onion and bacon here takes the pudding into new and exciting territory. For one thing, these enhancements give it some extra heft, creating a more substantial side dish than the airy, buttery Yorkshire we know and love. 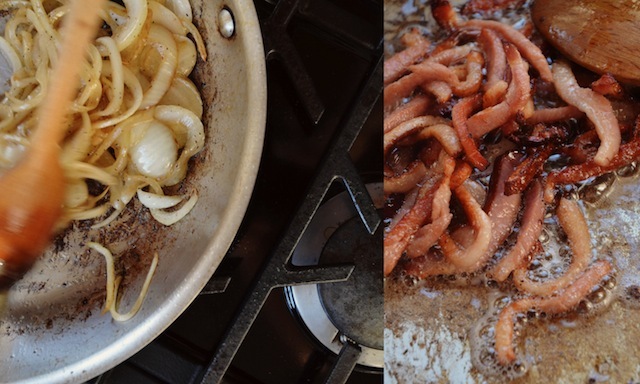 What’s more, the caramelized onion acts as a foil for the richness of the bacon and the rendered fat, which for its part deepens the overall flavor of the dish and imbues it with a subtle, smoky quality. And for those of you questioning whether it might all be a little too much — pork and beef . . . on one plate, I say simply: it’s the holidays! 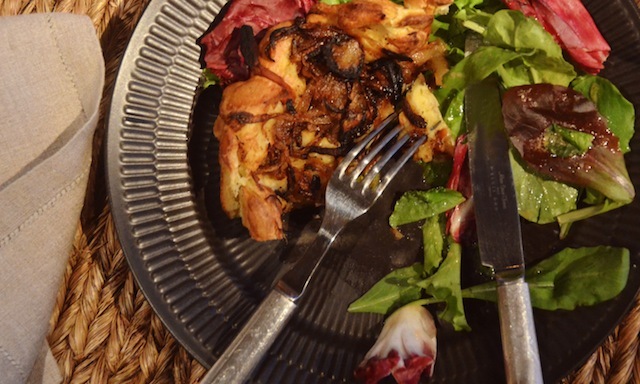 (But yes, you can always have the tart on it’s own, served with a side of greens as I did in the images here; an infinitely more sensible option to be sure, and almost as satisfying as the holiday meal I’m conjuring). And did I mention that it’s easy, too? A simple batter of flour, mustard powder, pepper, milk, and eggs is whisked together, allowed to rest for a few minutes, then poured into a baking dish that already holds the rendered bacon fat (and which has been heated in a 425 degree oven for ten minutes). 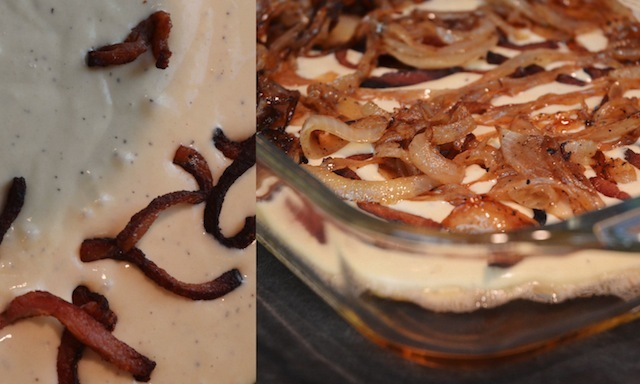 The crisped bacon and caramelized onion are then sprinkled across the batter, at which point the baking dish is returned to the oven for 30 minutes of cooking. This is when the real fun starts, as there are few things more gratifying than watching as something you’ve prepared turns all golden brown and bubbly before your eyes. 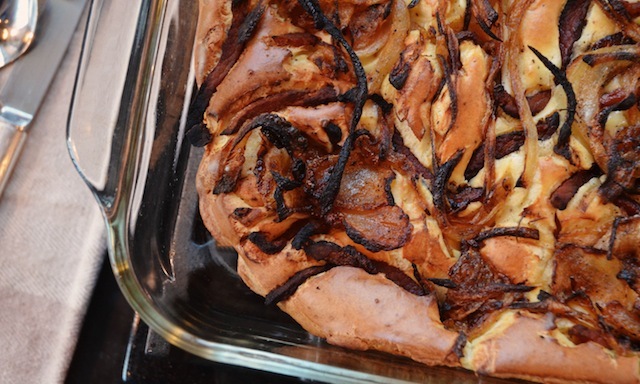 Imagine a popover, but in one large baking dish. Now imagine biting into it. . . buttery, a little chewy, with just a hint of smoke and sweet. Yes, it’s just that good. 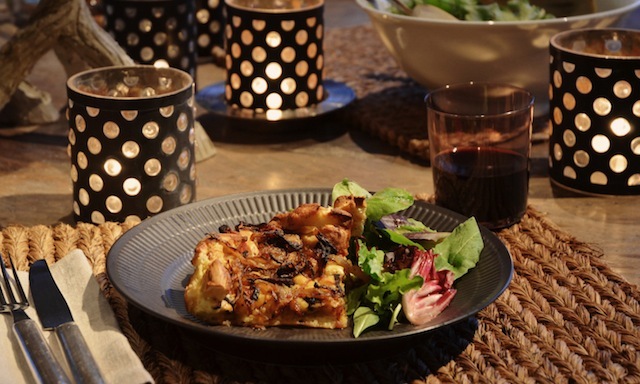 Wonderful things can happen when eggs, flour and milk are introduced to a little liquid fat! One final time saving suggestion: instead of the slab bacon called for in the recipe, look for the thick cut variety sold at many markets. 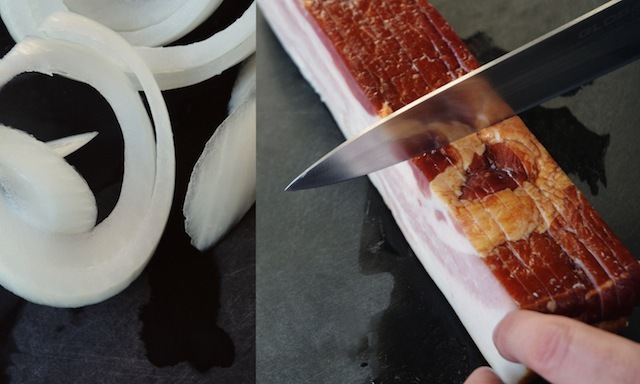 This will trim your prep time in half, since the bacon must ultimately be sliced into matchstick slivers before cooking. —Heat bacon in a 12” skillet over medium-high heat, and cook, stirring occasionally, until fat renders and bacon is crisp, about 12 minutes. Using a slotted spoon, transfer bacon to paper towels to drain; pour bacon fat into a 9” x 11” baking dish and set aside. 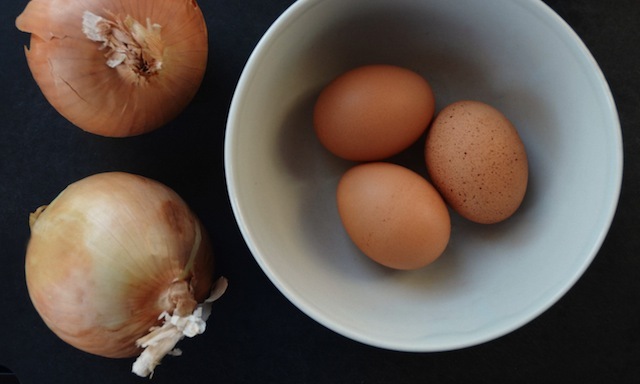 —Return skillet to medium-high heat, and add butter; add onions, salt, and pepper, and cook, stirring, until lightly caramelized, about 10 minutes. Remove from heat and set aside. —Heat oven to 425 degrees. 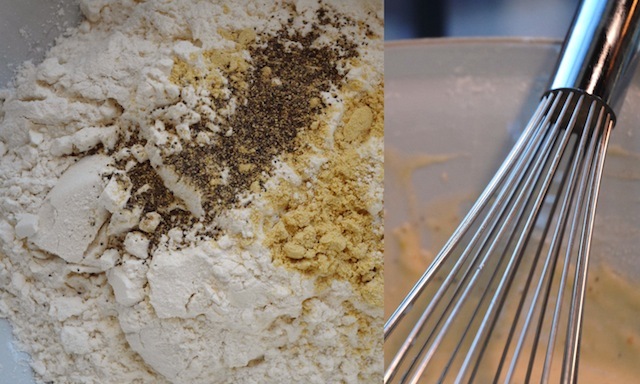 In a large bowl whisk together flour, mustard, and pepper; add milk and eggs, and stir until smooth. Let batter rest for ten minutes. —While batter rests, place baking dish with bacon fat in oven and let heat for 10 minutes. Remove baking dish from oven, pour in batter, and sprinkle with rendered bacon and caramelized onions; return to oven until puffed and golden brown, about 30 minutes. —Cut into squares and eat immediately. This seems like the most delicious holiday treats. I can barely look at it without drooling.